The last three-wheeler I had been in was a 1936 Morgan; this was new, bigger and marginally slower. It was also a boat. Boats on wheels were commonplace in World War Two, but they were essentially trucks that floated; this was undoubtedly a real boat with add-ons. The wheels were Sealegs units, familiar from beach launched sea rescue boats and boats owned by wealthy waterfront property owners. But, hey, this one weighs 10 tonnes loaded; nothing close to this has been built before. And it was built in Western Australia: a local triumph. Wilson’s Promontory, ending in the southernmost point of mainland Victoria, is entirely national park and Class A reserve and also a glorious wilderness. So wild, the only facility there is a camping ground. 400,000 visitors are attracted each year, but the Parks and Wildlife people were keen to attract more, and they believed the adjacent ocean and islands featuring abundant seals and whales would be a drawcard. Unfortunately there is no jetty to berth a tourist boat and they do not want to build one: the beaches are superb and pristine and they want them to stay exactly that way. They approached Rob Pennecott, operator of award winning marine eco tourism in Tasmania, for suggestions. 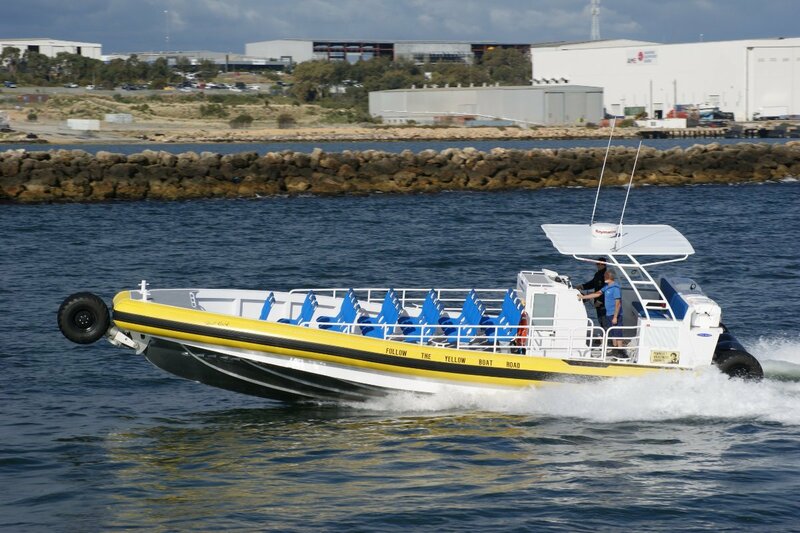 A boat on wheels was his answer, and it would be a Naiad rigid inflatable built by WA’s Kirby Marine like the rest of his fleet. A builder who initially wondered if it were possible – this was uncharted territory - but started work anyway. Jointly Kirby, Naiad New Zealand and Sealegs created the design of “Skull Rock”, catchily named after an island near the promontory. Out of the water and clear of the ground this modest sized commercial vessel looks enormous. Its wheels seem disproportionately large and the overall impression is of a vastly scaled up toy. 30 passengers sit in considerable comfort with a surprising amount of space around them; surprising for a vessel of only 11.35m overall. These seats are mounted cinema style on a deck sloping downwards from the skipper’s console in the interest of a good view ahead for everybody. This console houses the toilet, understandably a compulsory feature. Some tourist boat features are missing. There is no awning other than a Bimini over the skipper and the rear rank of passengers. No snack bar, or even a few eskies. Weight reduction is one reason – that 10 tonnes is an absolutely unbreakable limit, with the apparently massive engineering having definite limits. Overhead clearance is another. It is a 2.7 kilometre drive from base to launch at the mouth of the Tidal River along a track through virgin bush. 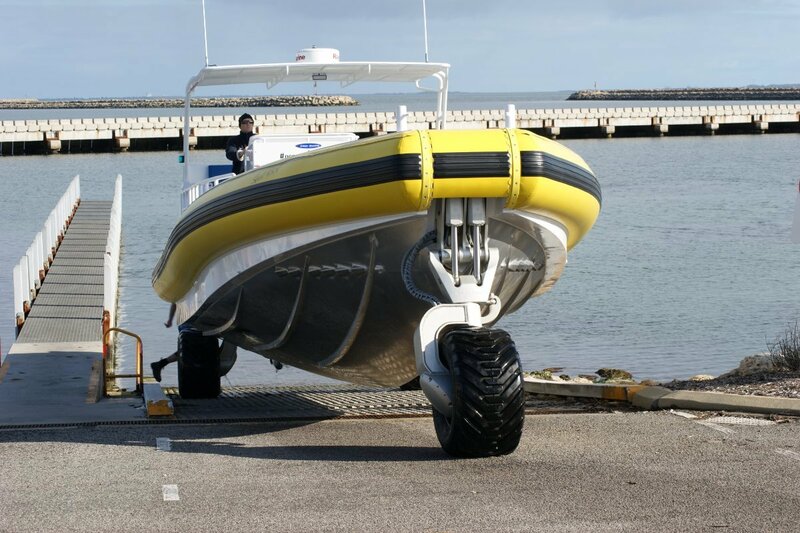 Weight determined propulsion by outboards: a pair of 350hp Yamahas. The motor to drive the hydraulic pump, which in turn drives the wheels and retracts them, would logically have used petrol too, but survey rules insisted on heavier diesel power, defended by weighty structural fire protection. That 10 tonnes was getting closer. The Yamahas are good for 38 knots, but operating speed is limited to 25 knots; above that a new set of survey rules would apply, which in turn would push the tonnage. The hull retains all the sea keeping ability of previous Naiads, but passenger comfort dictates adjustment of speed or postponement of a trip to suit weather conditions. After entering the water the wheels retract, by hand if the diesel pump fails, to be clear of the water. Trials were lengthy, and one of the goals was to ensure that the bow wheel stayed above the water under all conditions. A day with possibly the biggest swell of the year provided the proof load. A team of volunteers impersonating passengers got airborne from time to time in conditions in which the vessel will never operate when on the job. All three wheels stayed dry. Besides achieving all the targets the trials were plain fun. Once afloat “Skull Rock” is unquestionably a boat rather than a vehicle, and playing with a boat of this size with all the manoeuvrability of a trailer boat was a rare treat.